The television star, and co-author of We: A Manifesto For Women Everywhere, shares wise words and helpful coping tools. Angela Matusik, Digital media executive, mom, movie-buff, shoe-hoarder. There’s something incredibly comforting about realizing that an actor you’ve been admiring for years is growing older, and wiser, right along with you. Gillian Anderson, now 48, has already done a lot for women in her lifetime. She’s made a career out of portraying sharp, determined, underestimated, career-minded, kickass females — Dr. Dana Scully on The X-Files, Dr. Bedelia Du Maurier in Hannibal, Detective Superintendent Stella Gibson in The Fall. She’s known to speak out about gender inequality in Hollywood, ageism in media and gay rights. If that is isn’t enough to merit a full-on girl crush (which, admittedly, I have had since the first time she put Mulder in his place), Anderson has now turned her attention to helping her fellow women in a more concrete way. I had the pleasure of chatting with them both the other day about friendship, being kind to yourself and the one important thing they do every day. It is so inspiring to hear about two longtime friends coming together to create a book designed to help other women. How did that journey come about? 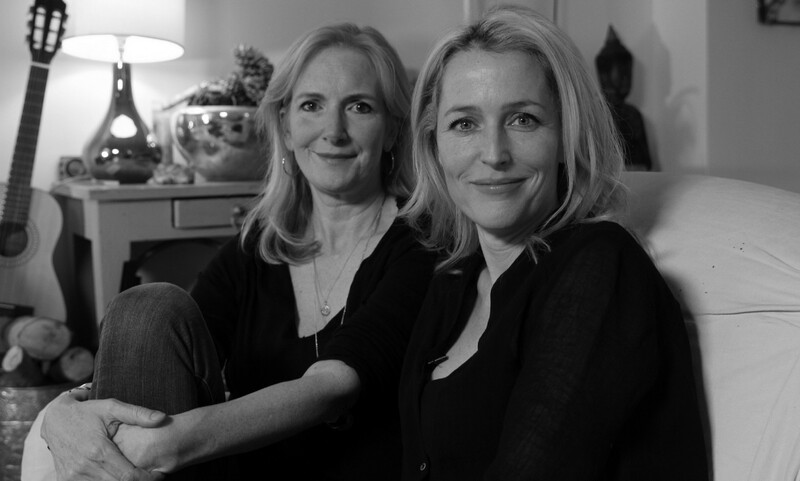 Gillian Anderson: We’ve been friends for a little over a decade. Over the years, we have very much relied on each other for comfort and advice, and being another ear to express struggles, concerns, fears, anxieties, everything. As girlfriends do. We realized we both had similar tools for dealing with our lives’ challenges and it suddenly became important to share them with others. We thought, what if we were to condense them in a way that would make them useful for women, to create some kind of a handbook, so to speak, for coping with life’s challenges? Jennifer Nadel: One of the things that connected us as friends is that we have both been looking for spiritual solutions to our emotional issues. This book is really a distillation of what we’ve found that works. The first part of the book lays down the foundation, then it takes you through nine core principles to practice. We’re conditioned to look after everyone else and self-care is thought of as indulgent and possibly selfish. We want to change that. You write about the importance of being a good friend for yourself. What does that mean? GA: One of the exercises in the book starts with making a list of things that we might do for a good friend who is going through a hard time and coming to stay. Very often, it’s easier for us to access that level of kindness and selflessness when thinking about somebody else. At the end of the exercise, you make a commitment to yourself to actually do some of those things for yourself. I, myself, find that particularly hard. I really struggle to create the time in my schedule to do things that part of my brain wants to believe are frivolous or time-wasters or whatever. I’ve worked in women’s media for most of my career and I used to say to writers, “Don’t do another story telling women to take a bath and light a candle.” But, if taking a bath is the thing that helps you feel better about yourself, then there’s nothing wrong with that. GA: Those little things, while they may seem frivolous, are really important. Baths are really important to me, but I really struggle to make them a priority. I don’t drink, I don’t smoke; there’s a lot of things that I don’t do that one might normally do to fill time and to escape. Taking a bath really makes me feel like I am caring for myself on a profound level. JN: We’re relational beings, and sometimes our connections with others come at the expense of our own connection with ourselves. The first section of the book is really about developing that relationship with ourselves, because we’re the only the person that’s going to be with us the whole way through this journey. Often, we miss that and do not nurture that most fundamental relationship. As we age, women often fear the milestones of their lives— perhaps hitting an age and not being as settled as they hoped, or going through something physical like menopause. How can we embrace the aging process more? JN: Our cultural values are driven by a very male way of looking things. Youth is prized. Innocence is prized. We need to reframe things. In the book, we highlight the Japanese philosophy of wabi-sabi which places a higher value on age and imperfection than it does on youth. For me, I try to feel amazed at what my body has done and still does. How it morphs and changes. I try to delight in that rather than fear it. GA: Not that long ago, I was doing an interview for a beauty magazine and was asked what I was likely to wear when I get into my sixties. I said “Hopefully, I’ll be at a point in my life where I’m wearing flats and not heels. I’ll still be dressed in all black, but they’ll be floaty, Museum-of-Modern-Art-style dresses, with ancient relics around my neck and my hair will be gray.” And the interviewer said, “Your hair is going to be gray?” I said, “Yes since I’m in my sixties, I’m going to hope that my hair is gray.” She said, “You won’t dye it?” It was such an interesting conversation because I really, really look forward to the time when I will allow my hair to go gray. Another point in your book is the idea of listening to your inner girl, of trying to remember moments of joy and discovery. JN: As we go through life, we try to forget painful moments from our childhood. For me, I have had to go back and reconnect with that wounded inner girl. As I do, my capacity for joy increases because that playful part of me was frozen at certain traumatic moments. GA: I find that very often when I’m refusing to accept something, or I’m having difficulty in relating to other adults, it’s often because my five-year old girl somewhere inside is having a tantrum about the fact that things aren’t going the way that I want them to go. Your book guides the reader through nine life principles to practice that combine spirituality, politics and psychology. That may be a lot to tackle for some. Is there one simple thing that you would recommend everyone do, every day? GA: For me, it’s become meditation. There have been periods of time where I’ve treated it more lightly and I’m definitely in a period right now where I see how vitally important it is. It’s become a daily morning practice. About 22 minutes a day, but I have worked up to that. We write about starting small, starting with just two minutes a day, and that makes it feel more doable. Then later in the book, as you can, start to build it up and build it up. After a while, it gets to a place where it feels like if it goes missing in a day, you feel it. I know for myself I really feel it. I feel it when I haven’t taken that time for myself. JN: For me, in addition, it’s gratitude. Trying to find ten things each day no matter how I’m feeling that I am grateful for. Sometimes it’s just the beauty of the clouds. With time, I find these small things feed my soul and it changes my attitude and my output. This journey takes place on a daily basis. We are spiritual beings having a human experience and particularly human, we are going to experience all the challenges that humans experience. That means that every day, if we want to be free from the more painful and unnecessarily painful aspects of this journey, we need to do these things. When we do, we feel so much better. We: A Manifesto for Women Everywhere is in bookstores. Buy it now at Amazon.com.